The Hawg Trough Fish Measuring Device has almost become the standard measuring device for fisherman across the country. Its concave design cradles the fish for simple measurement. Available in white and yellow the Hawg Trough measures fish in 1/4 inch increments from 8 inches to 30 inches in length. A word of advice: The Hawg Trough does not float but it luckily has holes on either end to attach a leash. A Plethora of New In Focus Videos! Well built and great price. ACK online shopping is excellent... super fast turn around time! Hawg Trough. Bought my friend one, so we wouldn't have to pass mine between Kayaks! The Hawg Trough was exactly as described. You will need to mark the lines with a Sharpie, but other than that, great product!! Would pay a few bucks more if all the lines were marked in black. Pretty basic measuring device, but it does the job. For competition you will need to darken the measuring lines. Does not float as is, but 3/8" dowels will fit in slots on back and will help it float and make more rigid (a good thing). Easy to store and access. After seeing a post on Facebook for this particular measurement device I thought I'd give it a look. It's exactly what is typically sold in store but way cheaper. Yes it doesn't float but that is easily fixed with some pool noodles. Marking the lines is a pain but worth it to save some money. All in all a very good price for this hawg trough. Will recommend this to all my angler friends. Good standard trough. Would be better if it came with black markings on the incremental measurements and would also be better if it floated. Both problems solved. One with magic marker and the other with strips of a pool noodle being glued on the bottom. Great all around product. With a great price. Only thing is it doesn't float, but like I said great price so who could complain. Hawg Trough - it will do the job I suppose, plastic feels flimsy, like it could crack easy. No lanyard attachment that SHOULD come with it for that price. I stuffed the half round cutout on the back with foam noodle so it would float. A captured market - should be sold at $9.99 at best. Hawg Trough. Flimsy. Had to use a marker to darken the lines. Going to put a floatation device on it. Wished I knew there were some out there that already came tournament ready. I really like it. i have one for my kayak and another for my friend's boat. It fits great in my PA14, I keep it on my right side and just lay the fish down into the recess to measure them. Product does what is it tended for. I have purchased like 4 or these now. It is what it is. Works as advertised. The concave ruler helps. Simple and effective. I'm not a tournament fisherman but I always compete against 'myself' for a new personal best. If this tool works for the tournament anglers out there, I knew it would work for me. This Hawg Trough Fish Measuring Device is awesome. I darkened all of the raised measure increments with a black Sharpie (see YouTube vids for how) so getting a quick measurement is faster and easier for my older eyes and added 3/8" wood dowels in bottom grooves for flotation (which already paid off) but I'd buy another Hawg Trough in a heartbeat. Forget the tape measures, the tailors tape, blah, blah, blah; been there and used them all but "this" item is by far the best. Highly recommended. 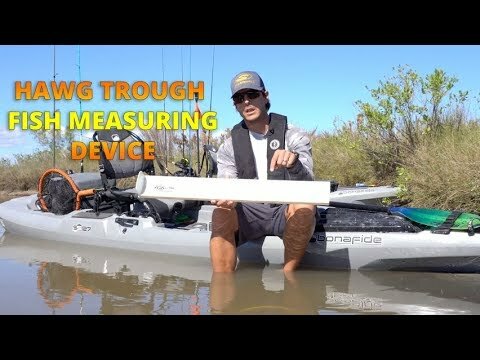 As a kayak angler, I purchased the Hawg Trough to record the length of a fish so that I could submit proof of my catch into TourneyX tournaments. Every single angler that buys this product has to take a permanent marker to it so that all the measurement lines can be clearly seen. The other modifiication is that some type of bouyant material is adhered to the backside of the trough so that kayak anglers can easily retrieve their trough from water when/if they drop their trough in any given body of water. So given these two things, I rate this product as average. I recently purchased my third Hawg Trough. Unfortunately, I broke the other two. That's my only complaint with them. The plastic is a little brittle. I am considering gluing some foam padding to the back, so that it will be less likely to get broken and so that it will float. I do like the width, which enables better picture taking of a fish to be released than a narrow measuring device. I always take a Sharpie and highlight the measurement increments, but this isn't difficult. While I don't like the fact the the Hawg Trough isn't rugged, the fact that I have bought the same product to replace the ones I broke speaks to the fact that I still think it is the best device for the purpose that is available. Great measuring tool! Just wish that the lines were colored in ahead of time, then it would be worth six stars. I just had my first bass fishing tourney in which we use the Hawg Trough to judge the winner CPR ( catch, photo and release ) I was disqualified because they couldn't see the measurements between the " inch " numbers. I will have to use a black sharpie to blacken them out for my next tourney. The product itself is nice and tough and lightweight. I have used many measuring devices in my kayak. This is the best, it is flexible and easy to store and will hold up in salt water. It's a Hawg Trough. Works great but needs improvement for use during kayak bass tourneys. Square dowels epoxied into the grooves on the back, lines marked black, and some foam to keep it from sinking. Super fast shipping right before the holidays. My husband loves it. Durable and true to product description. Works great. Has a slight belly in it which helps keep the fish from sliding around when measuring. Has a couple holes where you can mount a bungee just incase it goes overboard. Checked several other stores around to keep from ordering online, and waiting. Should've just ordered it from ACK to began with. Ordered the Hawg Trough about noon, and it was delivered the next day! Fantastic product! I will not hesitate to just order it from ACK next time. Slightly disappointed in this product. Does it measure fish? Yes, which was the ultimate purpose for the purchase but here are my design flaws. The product sinks. To alleviate this I read you can place two dowels down the back side or foam. The ruler is the same color as the board making it difficult to read. I suggest as others have as well using a sharpie to help differentiate. Lastly, very thin plastic that I would imagine will brittle in the sun through time. I don't expect more than a couple of seasons use out of this product. Products was great for the price. Hawg Trough measuring device: Great device ,but needs to be longer to measure Cobia and Amber Jack caught in the Gulf!! Why not go out to 36"? A great ruler that has a couple of issues. First this is much easier to use than the folding ruler I had been using. Like others have said it would be nice if it came with the hash marks in black and if it were capable of floating. I will say a sharpie and a can of great stuff fixed these two problems easy enough though. Love my hawg trough! I bought this for a tournament, but have enjoyed using it for my everyday fishing as well. This is a fantastic product! I bought it for a tournament, but have enjoyed using for everyday fishing as well. This has become an essential piece of my fishing equipment. Product does the job. The length is appropriate given the types of fishing I do. Wish the construction were much durable. I can see an accident occurring where this may accidentally crack. Very effective and did its job it's a little Flimsy so I glued wood dowels in the bottom tracks and it is very sturdy now. great product....there are multiple ways to secure the hawg trough to your kayak, I like the RAM ball going through the hole and fastening to a geartrack.....works for me! I like it.Use it all the time. This is my second one. They are a little flimsier than I'd like but can last a while if your aware of your surroundings/actions. As others have stated the lines need to be marked and it should float. I found suggestion to insert a 3/8 square or round dowel rod in the 2 slots on the back. Great price and works great otherwise. The lines need to be black like the numbers are. Other than that is a good product and a must have if you kayak tournament fish. The Hawg Trough measuring stick needed to have the increments painted or marked like the inch marks were. Other than that, good product. Hawg trough is plastic construction and the measuring tick marks are non-marked. Would be nice if they were since it's required for tournaments. Easy fix with the side of a sharpy marker though. This one does not float but there are two small troughs build into the bottom where I glued in backer rods (used for filling deep voids when applying a sealant or caulk). This was also an easy fix and works great. I would deduct a star for not being marked since it is required but that was clearly conveyed and would add cost. So I maintain the 5 stars for passing the savings to me. First impression seemed a little flimsy but it's light and works just not sure how long it will last if you are mounting it I don't think it's strength would be a concern but I plan on leaving it un mounted and was concerned a bit but it may last decades I have only had it a few months. Good product except the lines are not detailed enough. Had to mark with a marker. Great product! Already gotten a lot of use out of mine. Great product. Note, this one doesn't have the measurement lines done in a contrasting color. Some tournaments require this. The hawg trough leave a lot to be desired for a fish measuring device. It must be marked with a sharpie to be able to see the lines in a photo. It sinks and you must add flotation. All documented faults. With this product being required to fish in many tournaments you would think someone would have fixed the flaws that are well known with it. 1. It sinks, it would be very easy to fix. 2. Easily broken with big fish. 3. And most important the customer has to color the lines with a marker to make the lines visible in an picture. Very frustrating that the hawg trough company doesn't try to improve their flawed product or that there isn't an acceptable alturnative to choose from. Good product, but it would be great if the lines were black. I cure this with a sharpie. It feels kind of light, but has held up to the last couple of trips. It just feels like you could break it easy. Hope it holds up! I just can't give it more than three stars. This is my second one and I only bought it because, well it's required for the tournaments. Why just three stars. First it's been out a while and by now the mfg. should have figured out we are having to use a permanent marker to highlight the division marks. 2nd the first one I had broke because it's really just a little too flimsy for kayakers and should be made a little thicker/stiffer. 3rd We have to modify them to make them float. So the idea is great and with a little effort from the manufacturer they could be a 5 star product. I really like the Hawg Trough, however, I took away 1 star for the following reasons. Trough does not float........There are 2 cavities along back side that I filled with backer board and now it floats. It is very hard to identify 1/4 markers in photos. I took a sharpie and darkened all of the lines. These seem to be easy remedies and think this would be 5 stars if it came this way. Super tool which will measure all my big bass! The hawg trough does exactly what it was designed to do. Keeps fish in place and is easily readable. Our fishing club "NAKA" uses this ruler as a standard for our tournaments. The fish are photographed and the photos are turned in at the end of the tournament. The markings are not clear enough to see in photos. I would like to see you go ahead and "blacken" the markings where they show easier. I also think that it needs to be a little more rigid. Over all a great product. tr s bon produit .tr s utile.le site de vente ACK et parfait .j ach'e depuis la France et tout ce passe correctement.merci. Two Fold Review - (1) The Hawg Trough is exactly as advirtised and is the product that I was expecting; no complaints. (2) The Hawg Trough has become the "go to" device across the country for competitions / tournaments. This device is flimsy, takes up valuable space on a kayak, and the accuracy from one board to another is inconsistant. When competitive fishing, buy 20 and then pick the one which will most benefit you. If you are not required to have this device by tournament rools, don't waste you money. Great trough, marked the lines with a permanent black marker, placed bubble rap on the back so it will float. Wonderful tool for catching the length of your fish. They just lay in it like there in a trance, most of the time. Great product, performed as it should. Purchased for an upcoming kayak fishing tournament. Put a measuring tape to it once arrived, no discrepancies. ***purchase & shipping was extremely easy and super fast. Great item at a great price, easy to use. This will cradle a fish well and has large numbers to easily measure your catch. A few negatives from a yak fisherman would be that it's bulky and doesn't stow easily. I would love to see a collapsable version of this. I marine gooped some foam onto the back to keep from losing it should it go overboard. A few minor changes would make this a great product. The hawg trough board is ok. It could be better if the board would float and had black lines in the measurements. Nothing ACK could do about that product bc I really like ACK, the shipping is super fast. Great product! Super fast shipping! The best boards out there. But they don't float! Should come rigged to float, but its a very easy fix. Nice board but all the lines should be premarked not just the numbers and it should float. Can be marked with a permanent marker and you can make it float with some 3/8 caulk backing foam. Gift for my son who has already measured the largest small mouth he ever caught. It works great and was delivered on time as advertised..
Nice, clear markings, just need some hawgs to fill the trough now! I bought the white Hawg Trough and it is perfect. Strong plastic construction. I got tired of rusting measuring tapes and yard sticks that break. This trough holds the fish well and allows exact measurements. I used a black sharpe and drew on some of the slot limit lines. I also drew some common size and bag limits on the back. Excellent product. Very helpful in measuring a catch accurately...sure beats holding a fish and trying to fumble around with a tape measure. Bought 2 of these so my wife and I can measure and photo are catches. We both belong to the Minnesota Kayak Fishing Association so CPR are catches. There just what we needed. The Hawg Trough is a great tool that would be better if the measurements were more visible. 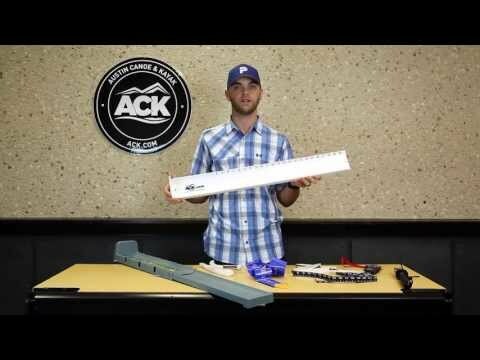 ACK is a great place to purchase from. Product was what I was looking for. I had to break out the Sharpie to fill in the lines to make it easier to read in photographs. I added 1/2 inch foam backer rod in the channels on the back to make it float. Great product! I'll preface this review by stating I fish from a kayak. When I purchased this, I was looking for a quick and easy way to measure fish. On that count, this works well. As many others have stated, it would be nice if this floated. With limited space on a kayak, My only problem has been where to stow this while I fish. I currently keep it in the front housed in my net, but I am looking for a more convenient solution. I need it to be both accessible and out of the way. I'm sure that I will come up with a solution. In all, I am happy with the product. The trough makes it much easier to measure then the other alternatives. Good but it isn't ready to go fishing right out of the box. It doesn't float but those channels on the back side will securely hold a few quartered wine corks. The raised incremental measurement lines are difficult to see until you put your steady hand and a felt tip marker to work. Another version of this device has the English/standard measurements on the top and metric measurements on the bottom for those fishing outside the USA. Its the perfect size and color, and reasonable priced. It's a little flimsier than I thought it would be but I like the light weight so I'm ok with that compromise. Now please make it float! Sure, I can make it float a variety of ways but I'd pay a few bucks more for one that floated right out of the box. Would like to see this made a litttle stronger. Worked well on my first trip out with it. My second time out it slipped off and slowly sank to the bottom of the Bay. PLEASE, help us save the environment and make the Hawg Trough FLOAT. So far so good. As others have mentioned, measurements can be bit hard to make out at times, and the constructions is a little thin and weak. It would be nice to see a new version with contrasting measurement increments, as well as a little sturdier construction. Its sole purpose is to measure fish, and making those measurement increments more discernible would make it better suited for that task. Add foam to make it float (just in case) and you're ready to go. Wish they would paint the tick marks black to make it easier to read, but that's nothing a permanent marker and some patience can't fix. Great product and very easy to use. I bought it because most kayak tournaments require one like this. I only gave it 4 stars because it needs to have the lines colored black with a sharpie and also a modification to make it float better. Other than that I love it and it holds the fish nicely and tucks behind the seat of my Ride 115x easily. Great product. Floats without adding any foam (salt and brackish water). The lines could be more visible. I simply took a Sharpie and highlighted the lines for the min and max sizes of the fish that I target most. This allows for quick at a glance checking and releasing. Being lightweight and plastic works ideal for kayak fishing. Simple, good product. Free shipping made it the best deal from ACK. Needs to have lines highlighted in black. Will try to mark with a sharpie but would have been nice to come with black lines. This measuring device is pretty much the standard for most all fishing, especially kayak fishing tournaments. It works and looks great. good product fraction inch lines could be more visible or colored differently. also, maybe a smooth surface would be less harmful to fish & slime coat. This is my second Hog Trough- Lost my last one during a fight with a foul hook cow nose ray- it fell overboard and sank- The size of the thing, hard to stow and it doesn't float are the major reasons I only gave it three stars- Surprising durable, easy to use, easy to photo fish measurements accurately- I had mine a year and used it a lot to measure fish and for tournaments- The storage problem of this 31 inch long, four inch wide appliance on a kayak is the other reason I gave it three stars- YakAttack makes a bracket for use on their big, expensive storage crate, but nothing else commercially available to securely attach the Hog Trough to your kayak that keeps it handy, secure and out of the way- some sort of "paddle keeper" bracket would do the trick, but no one has come up with this-YET. hawg trough works as intended but the lines are hard to see in bright sun in pictures and i was disappointed at how easily it cracked. Great product! I recommend adding some spray foam to make it float and sharpie the lines to make them stand out. The ruler has been great so far. I had to use a sharpie to make the measurements more legible, but other than that it has been a good addition to the kayak. I would like to see a version that is a bit more sturdy as this one has some flex to it which makes me doubt its durability. I'd also like to see a floating model. I sprayed expansion foam in the back of this one to make it float. $20+ dollars for a flimsy piece of plastic that doesn't float seemed a bit steep, but there isn't much else on the market to compete, so I'm still giving this item 4 stars for functionality and form. I bought this measuring device after seeing a buddy with one. I used a sharpie marker to make the 1/2 and 1/4 inch markings more visibile. I like that its concave design makes measuring the fish quick and easy as the fish just setttles into the grove and stays in place. Another feature that I like is the high visibility of the yellow one. Its almost neon in its brightness, which makes it a handle tool to increase my visibility on the water while fishing from my kayak. Good product is easy to photo and see as most competions are picture and release. It does float if you forget to tye it down. Q: Do you have a longer trough? 30" is not long enough. 40 or 48 would be much better. A: Unfortunately, the longest Hawg Trough we carry is 30 inches.